A fresh solution to the problem of urine odor, this pad stops odors by killing odor-causing germs. This washable and fully reusable premium bed pad by Salk features a Halo Shield coating that picks up chlorine molecules during machine washing for added bacterial protection. Anti-microbial protection destroys 99.9 percent of odor-causing bacteria within 10 minutes of contact. A soft top layer pulls moisture away from skin while the 100 percent waterproof backing protects surfaces. Under normal laundering conditions, the pad can be washed 150+ times. Pad can be put in the dryer. 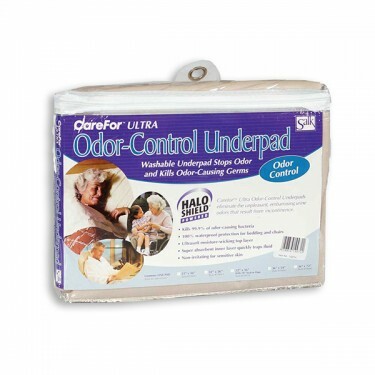 The HaloShield (odor eliminating) properties are effective through 75-100 launderings. Made in the USA! Latex Free. Note* Add 1 cap of bleach with each washing to reactivate haloshield. I use these on the bed to protect the sheets and mattress for my mother who suffers from incontinence. We also use it on a reclining chair when needed. They work well and are durable having to be washed frequently with hot water. Pros:Size covers a large area and protects well. Cons:Can't think of why I wouldn't suggest this product to others. Good product if it holds up after many washings. Pros:It 's size and it works. Bought this to protect the bed when my back went majorly out, pads weren't enough. This is used doue to incontinence and subsequent leakage sometimes.. Works great to keep the laundry work down to a minimum..
Pros:Wicked moisture leakage etc away so was able to get sleep without unnecessary waking. Halo shield kept urine smell to a minimum. Excellent all around. Cons:Nothing I can think of.